One of the biggest barriers to homeownership is amassing the large down payment necessary to purchase a property. This is especially true post-housing crisis, with no money down mortgages largely a thing of the past through traditional avenues. Interestingly, studies have shown that low credit scores are a lot more dangerous than low down payments, though a combination of both could be a recipe for disaster. And even though there are now conventional loan programs that allow LTVs as high as 97%, along with FHA financing that requires just 3.5% down, many still seem to have trouble coming up with the necessary funds to achieve the American Dream. But what many prospective home buyers may not realize is that there are scores of down payment assistance programs available to them. And I’m not talking about dodgy private lending companies, I’m referring to legitimate state-run housing agencies. A new analysis from RealtyTrac and Down Payment Resource revealed that 87% of the properties in the United States qualify for some sort of down payment assistance. Yes, there are income limits as well, which may prevent some buyers from taking advantage of such financing options, but the limits are often pretty high. The pair of companies noted that more than 68 million U.S. properties are eligible based on maximum home price limits. 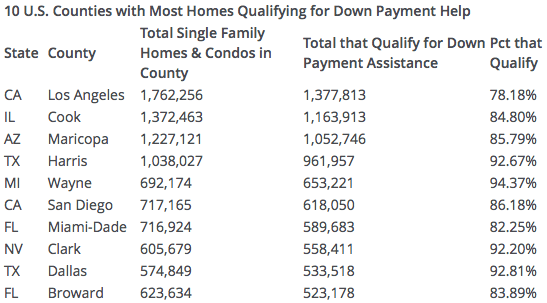 In fact, at least one down payment assistance program is available in every single county nationwide. And in 2,000 counties nationwide there are more than 10 such programs available to homeowners who actually bother to seek them out. While these programs appear to be plentiful nationwide, the most can be found in the South, with the West not far behind. The states with the most down payment assistance programs include California, Florida, Texas, Maryland, and New York. The analysis found that the average amount of down payment assistance is around $11,565 across all counties. Obviously it can be substantially more in places where home prices are higher. Typically, it comes in the form of a Community Second, which is a second mortgage with a very low interest rate or no interest rate at all. And in some cases, it is forgiven as the homeowner makes on-time payments. These subordinate loans can reduce closing costs from as much as $20,000 to just a couple hundred bucks. And they can often be combined with a first mortgage from the same housing agency to lower the total mortgage payment even more and/or push the out-of-pocket down payment to zero. Or with FHA/VA financing. Borrowers can also take advantage of Mortgage Credit Certificates (MCCs), which are federal tax credits that can increase household income by offsetting taxes. There are also housing grants and other special programs geared toward teachers, firefighters, police, military, and other public servants that make homeownership more accessible. Just keep in mind that these programs do have many restrictions in place to ensure the assistance falls in the right hands. That means you often need to be a first-time home buyer who doesn’t make more than the median income for the area in which you’d like to buy. Additionally, the home should be your primary residence, not an investment property or second home. You’re also most likely looking at a 30-year fixed-rate mortgage as opposed to anything exotic like an ARM. And a decent credit score may also be a requirement. Down Payment Resource claims that 24% of mortgage borrowers are denied loans due to insufficient funds. At the same time, these borrowers are eligible for an average of seven down payment assistance programs. The takeaway here is there are tons of financing options for would-be homeowners that are often never even explored, and many could be missing out simply because they’re not doing the research. If you’re setting out to buy a home, it might not hurt to look up your state’s housing finance agency (HFA) to see what it offers.